The success of our digital nation relies on mutual efforts of the public and private sector. The e-Residency program encourages businesses build value-adding services that complement state e-ecosystem and improve lives of both local and e-Estonians. Allies does just that. By tapping into Estonia’s digital talent, who, among others, have contributed to unicorns like Skype & Transferwise, Allies match-makes e-resident businesses with IT, digital & creative agencies to enable local and e-Estonians tackle business challenges together & with confidence. Unless you are Pope Francis or Angela Merkel, it is likely you fall under the 77% of e-Residents whose motivation for joining is “running location-independent international business”, “bringing business to Estonia” or “being a fan of e-residency”. You go with Holvi or LHV to open a bank account. You turn to other Service Providers for miscellaneous requests or find solutions to your problems through old fashioned Googling. These are all great: the essentials, the tip of the iceberg. Like when moving to a new city, it will only truly reveal itself after you’ve been there for a year or two. Or, you’re well-connected and have a local to show you around. 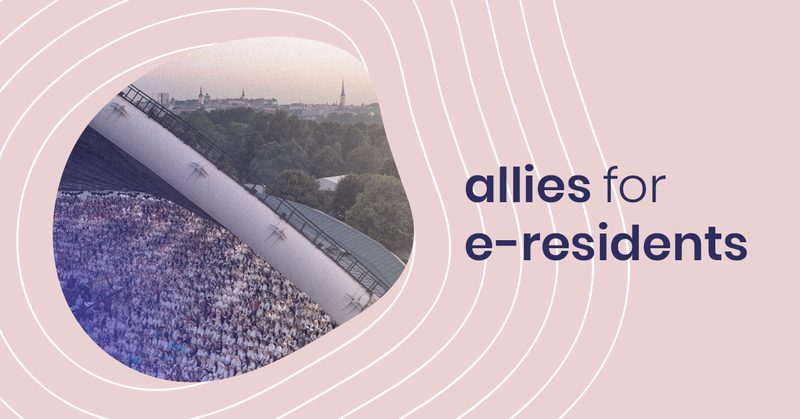 Allies will help e-residents by introducing you to the IT Talent Pool behind Estonia’s digital success. The policy-makers as well as our government’s foresight to invest in e-solutions and digital education deserve a lot of praise, but the key behind Estonia’s e-revolution are the people that work in and around our ICT sector. It’s the developers, system architects, designers, enthusiasts, educators and businessmen who work day-in-and-day-out to make our digital ecosystem happen. And these are the very people whom Allies will introduce you to. As a curated matchmaking platform, Allies connects businesses and their projects to the right IT, Development & Creative Agencies. We have 30+ agencies in our network, all of them boutique, 3–50 people, experts in their own craft, ranging from Web, Mobile App & Software Development to Digital Marketing & Design Agencies. Whether by developing MVP’s for Estonia’s start-up success stories, designing brands and websites or working alongside the e-residency project itself, these agencies all contribute to making e-Estonia happen. And, as locals, we know who the most suitable partner for you may be. Based on the essence of your project, timeline, budget and goals, Allies will put you in touch with the right creative and development houses to tackle the challenges of your business. Allies agency network is growing fast and our partners are ready to work on your next project. We introduce you to the agency best-suited for your business. Just as you don’t pay Momondo or Booking.com to find your best flights and accommodation, Allies will not charge e-residents for introducing you to the best digital talent. When you’re ready, we’re looking forward to helping your business at Allies.